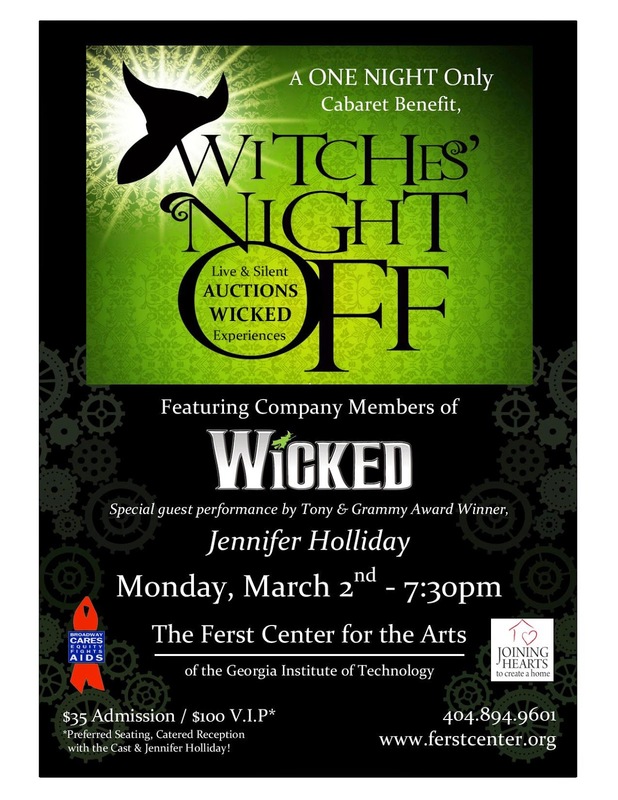 Produced by company members of WICKED, the evening is an opportunity for them to step out of their roles in the musical and kick up their heels performing some of their favorite non-Ozian material. WITCHES’ NIGHT OFF (WNO) is an event that benefits both Broadway Cares and Joining Hearts, Inc.
WITCHES’ NIGHT OFF is part of an ongoing series of performances by the touring company to support charitable causes. The WICKED, Munchkinland Tour has raised over $2.8 million in donations for Broadway Cares/Equity Fights AIDS and local AIDS service organizations all over the country. VIP admission is $100, which includes a pre-show reception with Tony and Grammy Award winner, Jennifer Holliday and WICKED cast members, preferred seating, and a gift. Regular Admission tickets are also available for $35 and Student Tickets are $20 with a proper Student ID. All proceeds benefit BC/EFA and Joining Hearts, Inc. The purchase of event tickets is tax deductible. Please call (404) 894-9601 or visit www.ferstcenter.org. Special thanks to Georgia Institute of Technology and all sponsors. This Monday night event will include LIVE auctions featuring opportunities to join the company backstage at Atlanta’s Fabulous Fox Theatre. - Watch the “GREENIFYING” of OZ’s most infamous lady. This experience includes a backstage tour plus 2 house seats for a performance of WICKED between Wednesday, March 4thand Saturday, March 7th. Other exciting LIVE auction items include your chance to experience the MUSIC OF OZ like never before. Bid and win your chance to “Sit in the Pit” with the musicians who bring you the Grammy nominated music of WICKED. You will hear the show with so many intricacies you never knew existed. The last and most rare of opportunities is your chance to win a WALK-ON ROLE in WICKED.This is a once in a lifetime experience… be IN this Broadway blockbuster. You can win the chance to wear a Tony-Award Winning costume and be in three scenes of Broadway’s favorite musical. WICKED will return to Atlanta’s Fabulous Fox Theater February 18- March 8th. Tickets forWICKED start at $33 and are available by visiting foxtheatre.org/wicked, calling 1-855-285-8499, or visiting the Fox Theatre Box Office (660 Peachtree St. NE, Atlanta, GA 30308). Group orders of 10 or more may be placed by calling 404-881-2000. About Joining Hearts, Inc. - Joining Hearts, Inc., is a 501 (c)(3), all-volunteer, non-profit organization dedicated to providing housing support to people living with HIV and AIDS in Atlanta. The mission of Joining Hearts is to raise awareness and funds to provide housing assistance to Atlanta 501(c)(3) nonprofit HIV/AIDS service organizations for people living with HIV/AIDS. Generous support from our Patrons, Sponsors, Host Committee, and volunteers enables us to produce high-quality, entertaining annual events. Whether you enjoy spending the afternoon outside socializing with friends old and new, or you prefer dancing under the stars, our fundraisers are events everyone can enjoy while also supporting a great cause. In addition to donating 100% of ticket sales and tips from our main event, good financial management has enabled us to donate the money remaining after all production expenses are paid.